THIS MANDAL WAS ESTABLISHED IN 1893. THE MANDAL ACTIVELY AND FAITHFULLY TAKES PART IN SCHEMES OF SOCIAL AWARENESS, ADULT-EDUCATION, ACTIVITIES AGAINST BLIND-FAITH, REMOVAL OF SOCIAL DIFFERENCES, DE-ADDICTION PROGRAMS, TO EDUCATE MASSES, EMANCIPATION OF WOMEN FROM DOWRY-DISPUTES, BLOOD DONATION AND EYE DONATION CAMPS. THE MANDAL HAS TRADITIONALLY DEPICTED THE SCENES OF OLD TEMPLES, PALACES, SCULPTURE AND FASCINATING SCENES. THE MANDAL HAS SO FAR DEPICTED REPLICA OF KONARK-SUN TEMPLE, PASHUPATINATH TEMPLE, MEENAKSHI TEMPLE, PALACES FROM VARIOUS STATES SHOWING THE INDIAN-CULTURE. 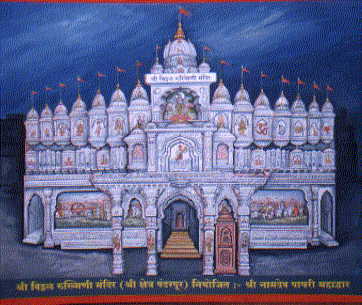 THIS YEAR THE SCENE IS OF NAMDEO MAHADWAR PAYARI OF VITTHAL-RUKMINI TEMPLE;SHREE KSHETRA PANDHARPUR .THE SCENE DIMENSIONS ARE 105 FT.X50FT.X77FT.HIGH. IT TOOK 3 MONTHS TO COMPLETE THE SCENE IN WHICH SHREEKRISHNA TEMPLE, PALAKHI-SOHALA, DINDI-SOHALA, KIRTANS AND NAMDEO MAHADWAR PAYARI ARE SHOWN. 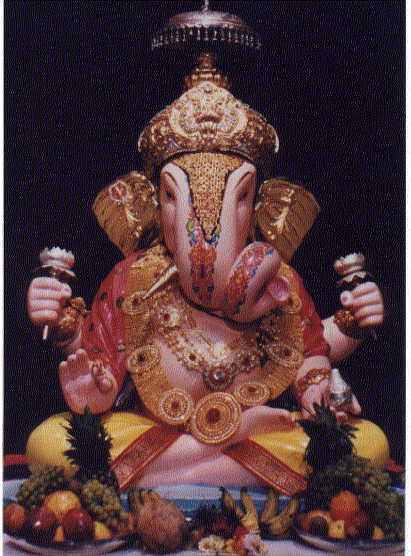 THIS YEAR THE GANESH IDOL IS ADORNED WITH 8 KGS. 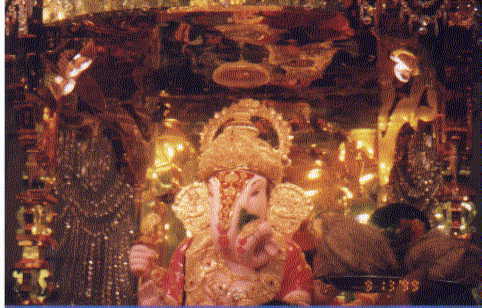 OF GOLD PITAMBAR ALONG WITH OTHER GOLD ORNAMENTS. FOR THE DECORATION OF SCENE 80,000 BULBS, 125 HALOGEN LIGHTS, 400 TUBELIGHTS ARE USED TO MAKE IT MORE FASCINATING. CHILD-CARE CENTER : THE MANDAL ARRANGES FOR FREE MEALS ,ACCOMODATION AND EDUCATION TO SOCIETY NEGLECTED CHILDREN. THE MANDAL ARRANGESe SANGEET-MAHOTSAV IN WHICH THE EMINENT PERSONALITIES FROM THE SAME FIELD ACTIVELY PARTICIPATES IN THE EVENTS SUCH AS PANDIT BHIMSEN JOSHI, PANDIT JEETENDRA ABHISHEKI, PANDIT SAMATA PRASAD, PANDIT JASRAJ, PANDIT BIRAJU MAHARAJ, PANDIT SHIVKUMAR, USTAD ALLARNKHA, SHRIMATI USHA MANGESHKSR, ASHA BHOSALE , PANDIT HRUDAYNATH MANGESHKAR AND MANY MORE. THE MANDAL ALSO TAKES ACTIVE PART IN OTHER CULTURAL ACTIVITIES.